A Stride Bonus Musketeer and a new G Unit for Machining. AUTO (VC): When your G Unit with “Musketeer” in its original card name STRIDE, look at four cards from the top of your Deck, Call up to one card with “Musketeer” in its card name from among them to (RC), and shuffle your Deck. 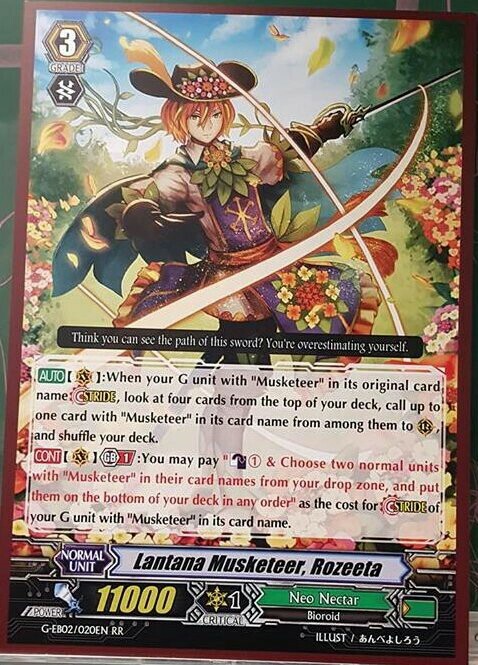 CONT (VC) Generation Break 1: You may pay “Counter Blas 1 & Choose two normal units with “Musketeer” in their card names from your drop zone, and put them on the bottom of your deck in any order” as the cost for STRIDE of your G Unit with “Musketeer” in its card name.